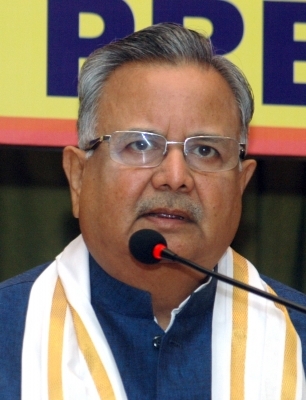 Raipur July 14 (IANS) Chhattisgarh Chief Minister Raman Singh says there is no anti-incumbency against his government despite being in power for over 14 years and that the ruling BJP is poised for a fourth successive victory in Assembly polls later this year. "The BJP is in power since December 2003 and there is still no anti-incumbency. I have travelled widely to urban pockets and rural belts this year during various public interaction programmes and clearly saw in people s eyes that they wish to see the BJP regime to continue " Raman Singh the longest-serving BJP Chief Minister told IANS in an interview. "Everyone even the opposition Congress knows in the state that anti-incumbency is nonexistent. People had some grievances in certain areas against local officials not against the state government. The government has reached out to these people through public interaction drives such as Lok Suraj Abhiyan Gram Suraj Abhiyan and Vikas Yatra. "It s people s desire in Chhattisgarh that the BJP deserves a fourth successive term. It speaks volumes about the development works and the kind of governance I have delivered in the state " the ayurvedic doctor-turned-politician said. "The state has witnessed a sea change during the BJP regime. You will find a network of quality roads in all 27 districts. Schools and hospitals have been opened even in forested areas " the 66-year-old politician said. He revealed that his government would be launching the world s largest free mobile smart phones distribution scheme in a month to women and college going students under Sanchar Kranti Yojana (SKY). Chhattisgarh has a history of bipolar contest between the BJP and the Congress. In the last Assembly polls held in 2013 the BJP won 49 seats while the Congress bagged 39. The Bahujan Samaj Party (BSP) and an independent got one seat each. But the vote percentage difference between the BJP and the Congress was less than one per cent and the overall vote difference was just 92 000 in the entire state. Chhattisgarh is now set to witness triangular contests this year as the state s first Chief Minister Ajit Jogi has deserted the Congress and floated his own outfit to nurture his dream of becoming the H.D. Kumaraswamy of Chhattisgarh if there is a hung verdict. Raman Singh acknowledged that there would a three-way fight in the state on certain seats in 2018 and the third player s entry into the electoral fray could spice up poll battle. Some analysts say he could away with 5 to 6 per cent of all votes primarily that of the Congress. Knowing his abilities BSP leader Mayawati has opened talks with him. But the BSP is also being wooed by the Congress which is desperate to end the BJP innings.